Your questions depend on the visual appeal and quality/condition of the item which one could only tell from seeing a photo. Looking forward to seeing your photo. Here are the photos, the entire label is legible and the bottle is in great condition with raised lettering which should allow for easy conformation on the make and year of the bottle. There is still beer residue in the bottle and I couldn't get a good photo of the cap, it reflects and gets blurry but it is original also. It is in the same condition I found it in, I keep it in an air tight glass container and out of the sunlight. For the benefit of others, I believe E&B is Eckhardt & Becker as in Eckhardt & Becker Brewing Co. The condition of the label hurts the potential value of this bottle. My gut reaction puts it in the $10-30 range with some possible upside if a collector of Detroit beer bottles did not have one and absolutely had to add it to his collection. ebay is your best bet to sell this. I might suggest that you provide the exact embossing that is on the bottle. A lot of collectors check in here and might be able to provide some more details on age and value. 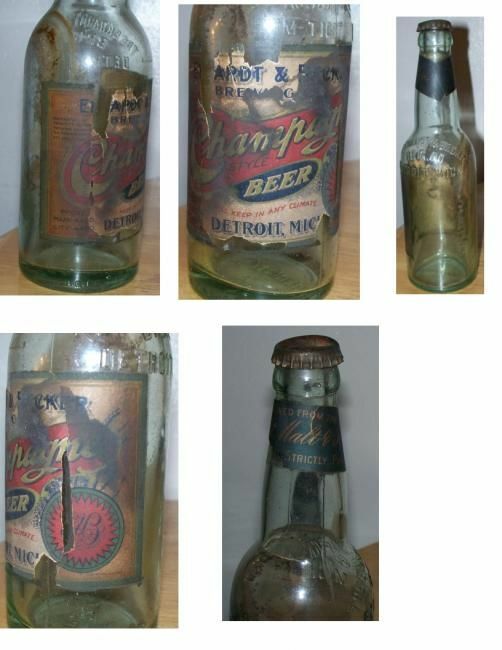 The Detroit history of Eckhardt & Becker Brewing Co. has roots in Detroit dating to 1790, but this particular bottle eludes mention, in fact, Champagne Beer was not introduced until the 40's and this bottle clearly states it's before the 1920 prohibition. I'm still tracking down all the information, but this product of beer was never sold and should not exist, so I figured it would bring a rare price. What I'm hoping is, that this was the first protest brewery burning that began the prohibition because it was set to be the first higher content of alcohol beer to be mass sold from cost to cost. That would make this even a larger part of history from the prohibition stand point. It's a very interesting bottle and I enjoy the hunt for the truth about something not easily found. Then there is some micro print on it in a different language with letters I don't have, I believe it's German. The cap is bright red with the letters ( E&B ) on it. We salvaged a bottle from St. Clair River Bottom is ABC and the last line on the side reads "Pure and without drugs or poison registered". Good to know when you buy your beer. I’m married to the grandson of August Ekhardt. Do you still have the bottle?